Slim down with these calorie-torching yoga moves. You know that yoga has impressive strengthening powers, but what you may not realize is that it can also count toward your cardio. Sun Salutations are an integral part of many yoga practices; when flowed through quickly, they give you the same boost as taking a brisk walk. Similarly, the moves here incorporate cardio bursts to amp up your burn and provide a metabolic joltâgreat if you're short on time (and who isn't?). Fit them into your routine three to five days a week. You'll knock off cardio and toning in one fast workout. 1. Stand at the front of the mat. Bring your feet together and bend into a chair squat. Lift your arms up to the ceiling; hold for 5 to 8 breaths. Sink down into your legs and drive from your hips. 2. Next, activate your core and throw your arms behind you for some momentum. 3. Jump high, lifting your arms to the sky. Land softly, bend back into the squat and repeat 8 to 10 times. This move fires up your core and builds balance. 1. Start on all fours with your hands under your shoulders. 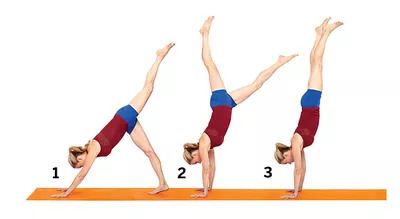 Lift your hips toward the ceiling to come into Downward Dog. Keeping both legs straight, lift your left leg. 2. Bend your right knee, then hop so your right leg lifts off the mat. (Beginners might find hopping with the right knee bent a bit easier.) Try to get your hips over your hands. Do 8 to 10 kicks on each side. My son and I have gotten into the habit of saying what we're grateful for each night. It's made me realize how much there is to appreciate. And the difference in my outlook has been hugeâI go to bed in such a happier, more peaceful place. Tonight, tick off what you're grateful for, and chances are you'll sleep more soundly, too. Phat Buddha Bleecker Tank ($50; Bloomingdales.com). Her shorts are no longer available, but you can find similar styles on theÂ Phat BuddhaÂ website.